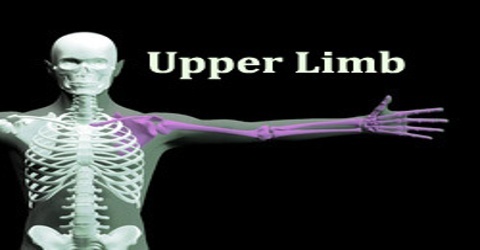 Upper limb is the area of the skeleton that is able to grasp strike and conduct fine motor skills. It is supported and stabilized by various muscles attached to the ribs and vertebrae. The upper limb and lower limbs were evolved basically for bearing the weight of the body and for locomotion. In quadrupeds forelimbs and hindlimbs are, therefore, built on the same basic pattern. 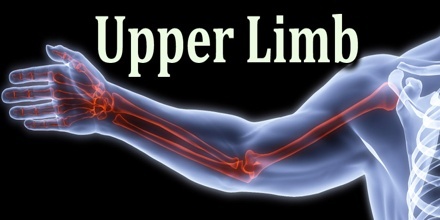 Upper Limb is the limb of the body extending from the deltoid region to the hand; it is specialized for functions requiring great mobility. Each limb is made up of a basal segment or girdle, and a free part divided into proximal, middle and distal segments. The girdle attaches the limb to the axial skeleton. The distal segment carries the five digits. 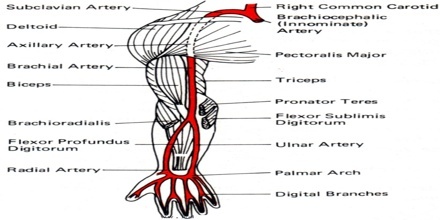 The two uman upper limbs are commonly called arms. They are connected to the trunk at the shoulder joint. 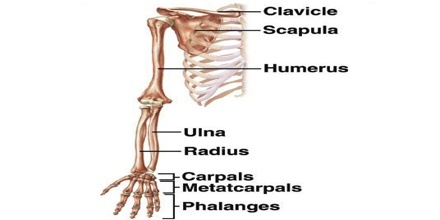 The arms consist of the clavicles, scapula, humerus, ulna, carpal, metacarpal bones and phalanges. The three joints of the arm are the shoulder, elbow and wrist. The humerus bone is solid and less likely to break than the forearm. The scapular region on the back comprising parts around the scapula. The bones of the shoulder girdle are the clavicle and the scapula. Arm – Also called upper arm or brachium, arm extends from the shoulder to the elbow (or cubitus). The bone of the arm is the humerus. Its upper end meets the scapula and from the shoulder joint. The shoulder joint permits movements of the arm. Forearm or Antebrachium – Forearm extends from the elbow to the wrist. The bones of the forearm are the radius and the ulna. At their upper ends they meet the lower end of the humerus to form the elbow joint. Their lower ends meet the carpal bones to form the wrist joiont. The elbow joint permits movements of the forearm, namely flexion and extension. The radioulnar joints permit rotatory movements of the forearm called pronation and supination. Hand – The hand (manus), the metacarpals (in the hand proper) and the phalanges of the fingers, form the metacarpophalangeal joints (MCP, including the knuckles) and interphalangeal joints (IP). Movements of the hand are permitted chiefly at the wrist joint. The thumb moves at the first carpometacarpal joint and each finger at its metacarpophalangeal joint. Bones of Upper Limbs are Clavicle, Scapula, Humerus, Wrist, Forearm and Hand. Hand is a marvelous organ. It performs precise and gross jobs with equal ease, facilitated by small bones, multiple joints and many small muscles both intrinsic and extrinsic. Hands could be gentle and tough. They can perform precise functions like writing, painting, playing musical instruments. They also enable us to perform heavy labor like using shovel, axe or drill etc. They are designed to put our hand where we want it to be, doing what we want it to do. They put the hand into desirable postions. They lift and rotate to reach something. Apart from enabling hand reach something, they also stabilize the limb so that hand could function to its best. Upper limb motions are also parts of gestures. Since early times we are using upper limb to make signs to approve, nod, call for help or stop. Thus our hands are important in communication, and we also use them while we talk to emphasize, compliment or dramatize our verbal communications.